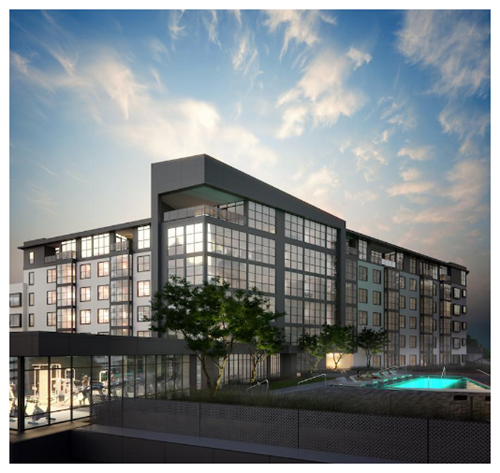 ​​ AUSTIN - A multifamily development has broken ground on a plot of land just east of downtown Austin. The Tyndall at Robertson Hill—182 for-sale residences at 800 Embassy Drive—is adjacent to the northbound lanes of I-35 at Eighth St. The development is projected to deliver in August 2018 and already 32 units have sold. The Tyndall will include a wide array of amenities—some 23,000 sf—from the requisite pool and deck with panoramic city views to climate-controlled bike storage to an intimate grotto area with an enchanting fire pit. Pricing for a 571-sf unit, for example, starts at about $260,000. The largest units, at about 2,800 sf, will top the $1 million mark. Compared to other condo projects under construction downtown, all upscale with price points above $700 per-sf, the Tyndall comes with more accessible prices point— at least $200 per-sf less.